Dental LT Clear Resin is a long term biocompatible material formulated for manufacturing dental splints and retainers. As a rigid material, Dental LT Clear is most appropriate for printing hard splints. If soft or hard-soft splints are desired, the best method is to print the model and thermoform. 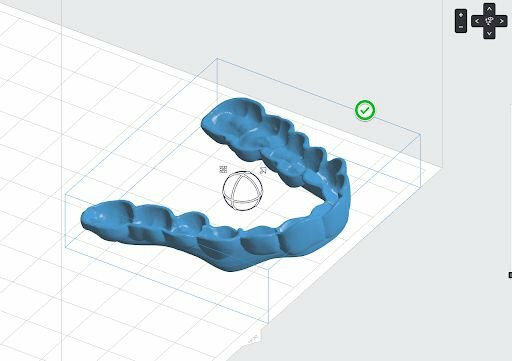 This application guide demonstrates each step for making 3D printed splints on Formlabs’ Form 2 3D printer. 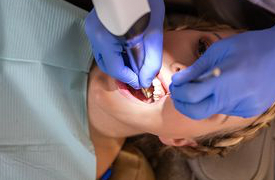 Use the following workflow to ensure precise results. 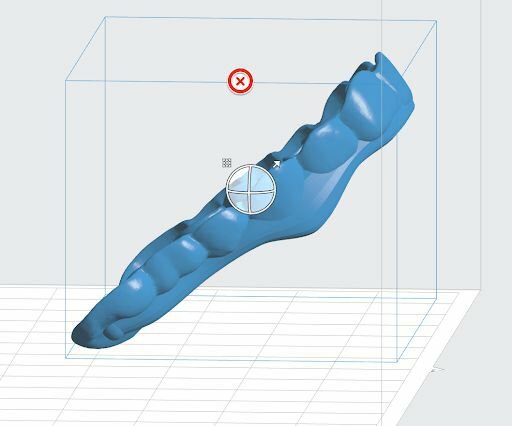 In order to print a model, anatomical data of the patient’s dentition must be collected with a scanner. 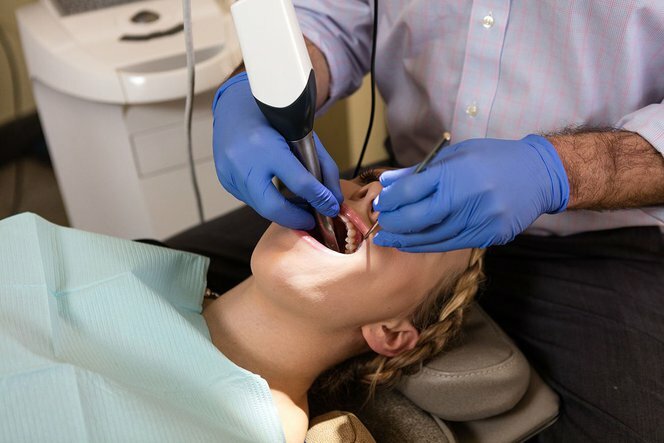 Either scan with an intraoral scanner directly with a patient, or use a desktop optical scanner to on a polyvinyl siloxane (PVS) impression. 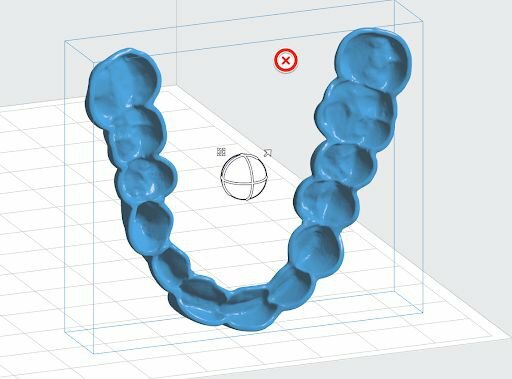 In order to print this scan data as a model, the data needs to be processed in dental CAD software. Make sure to pick software with a model builder module that offers open .STL export. 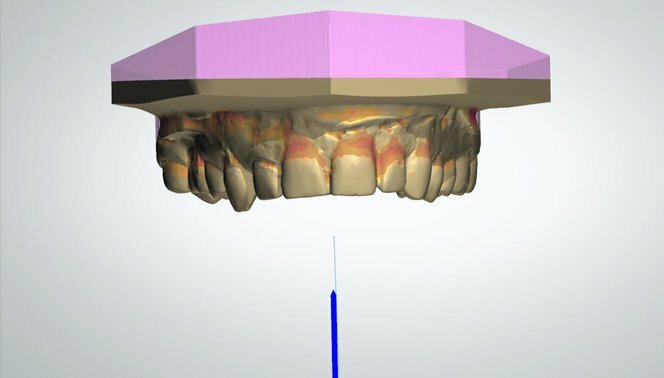 First, import the intraoral or desktop optical scans of the patient dentition into your preferreddental CAD software. 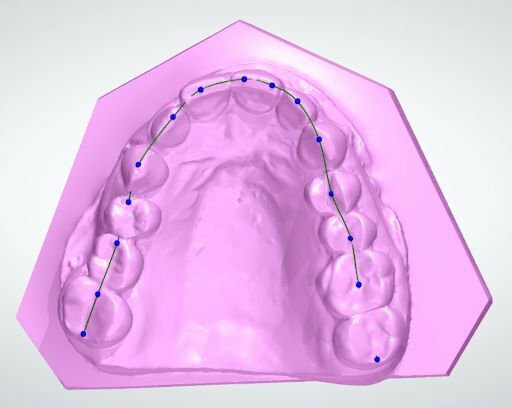 Use line marking or area selection tools to remove erroneous scan data, and select only the portion of the dentition that will be printed. Ensure that the model is blocked out adequately where needed, depending on the specifics of the case. Block out undercuts directly to impact the retention of the splint. 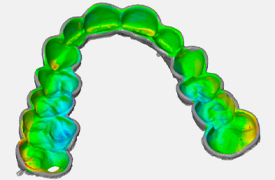 Left: Splint boundaries defined using spline tools. Right: Automatically generated initial splint mesh. To design the splint, use spline tools to mark the margin of the splint along the perimeter of the arch. 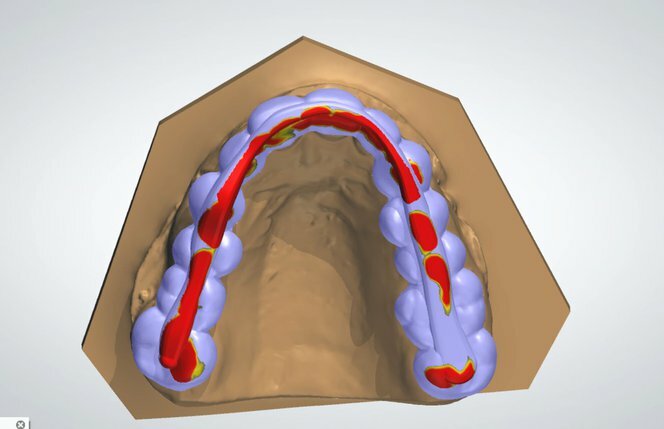 Generate an initial splint design, using a minimum thickness of 1.0 mm and an offset of 0.1 mm. Adjust the design manually using standard sculpting tools if necessary. Left: Splint bar path defined using spline tools. Right: Automatically generated bar mesh applied to the splint mesh. 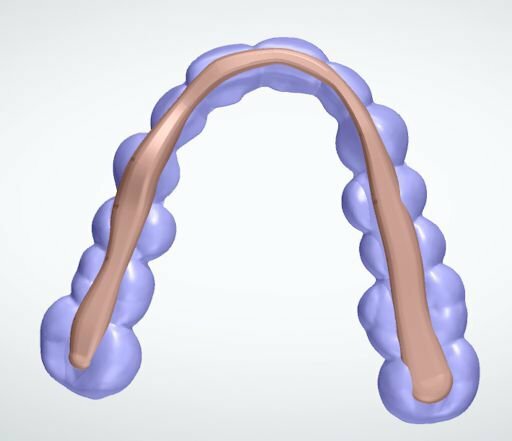 In splint design software that offers the option, use the spline tools to generate a bar and combine it with the splint design. Ensure that the total initial thickness of the bar and shell are at an initial minimum of 3.0 mm, to allow space for antagonist adaptation. 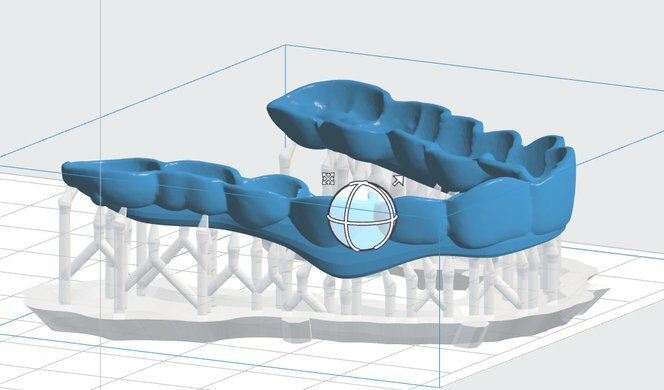 When using splint design software that does not allow for the generation of a bar, ensure that the bottom surfaces of the splint are at least 1.5 mm thick. Remove material on the underside of the splint to adapt the design to the antagonist. 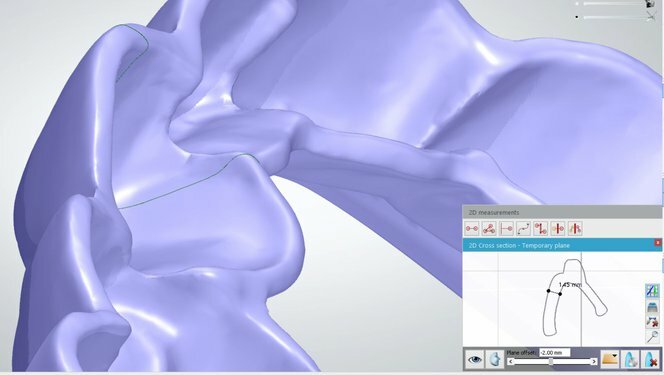 Use static occlusion or dynamic occlusion via a virtual articulator, depending on the CAD software. Using inspection tools to ensure that side wall thicknesses are greater than 1.0 mm and bottom surfaces are thicker than 1.5 mm. 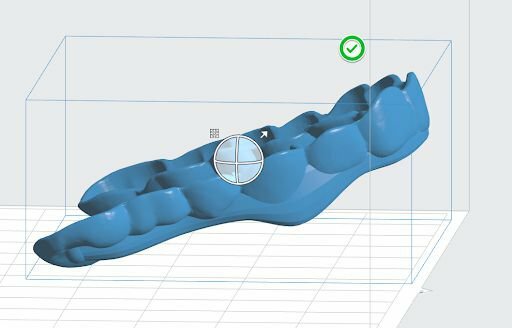 Inspect the model to ensure that the part is not thinner than 1.5 mm at any point in the occlusion or 1.0 mm in the side wall. Adjust the design manually using standard sculpting tools if necessary. Finalize the design by double checking the occlusion and articulation of the model and splint. 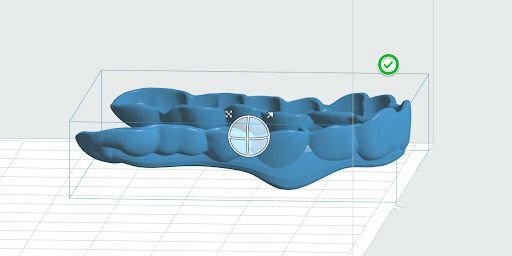 Once the design is created, export a digital model of the part in STL or OBJ file format. Open PreForm. Select “LT Clear” from the Material menu. Import the .STL or .OBJ file into PreForm. Orient parts with the intaglio surfaces facing away from the build platform, to ensure that supports will not be generated on these surfaces. Ensure that parts are oriented at an angle of 30° or less. Orienting parts upright or at angles more than 30° will compromise precision and lead to poorly fitting parts. When angling the model in PreForm rotate the anterior portion upward and away from the build platform so that the posterior ends remain closer to the build platform. Printing at greater than 30° angles will result in poorly fitting splints. 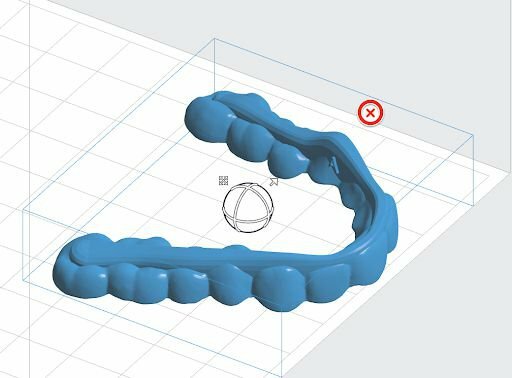 As the angle of inclination of the part increases above 30 degrees, interproximal surfaces will print less accurately, which may result in a poor fit. Generate supports using PreForm’s auto-generation feature. Inspect the part to ensure there are no support touchpoints on intaglio surfaces. Use the manual support editing feature to add or remove supports, if needed. agitate the resin cartridge before inserting, by shaking and rotating it several times. Place the build platform, with surgical guides still attached, into a Form Wash filled with isopropyl alcohol (IPA, 96% or higher). Set Form Wash for 5 minutes, which will clean the parts and remove liquid resin before post-curing. Leave parts to air dry completely, or use a compressed air hose to blow IPA away from parts’ surfaces. Inspect parts closely to ensure all uncured resin has been removed. 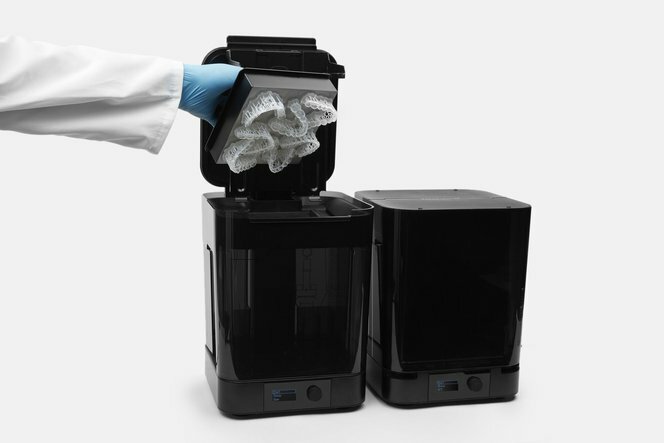 Repeat wash if necessary, but do not leave parts in IPA for more than 10 minutes, as this may reduce mechanical performance and cause defects in the printed parts. Remove parts from the build platform with the part removal tool. Printed splints must be exposed to light and heat to achieve biocompatibility and optimal mechanical properties. Place the printed parts into a Form Cure. Post-cure for 20 minutes at 80 °C. Post-curing outside of the recommended settings can lead to extreme discoloration of the parts. Post-curing at too high a temperature, for too long a duration, or with too high intensity of light can cause yellowing. 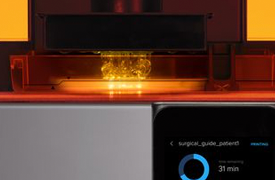 In addition, improper post-curing steps can also lead to sub-optimal mechanical and biocompatibility properties. 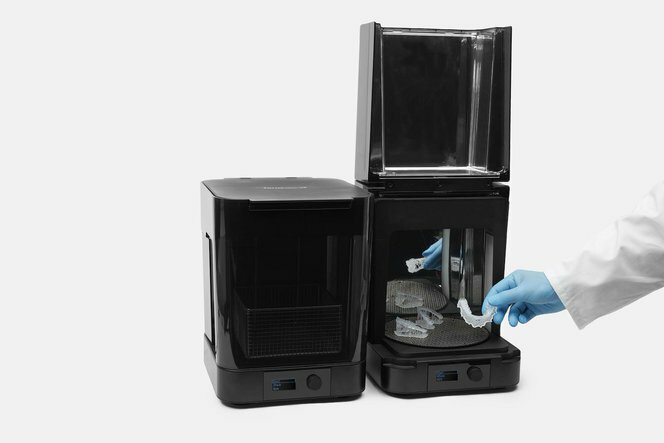 Post-cure only in accordance with official recommendations from Formlabs for the clearest and best possible results. Printed splints must be exposed to light and heat to achieve biocompatibility and optimal mechanical properties. Post-cure time depends on the light intensity and the internal temperature of the post-curing device. One acceptable method for post-curing is exposure for 10 minutes to 72 watts of Blue UV-A (315–400 nm) in a heated environment at 60 °C (140 °F). One acceptable lighting setup is four 18W/78 lamps (Dulux blue UV-A). 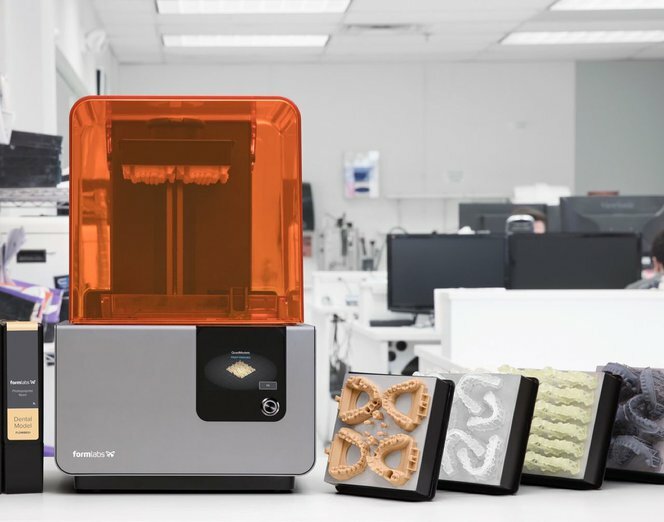 Use the flush cutters included in the Formlabs Standard Finish Kit to carefully cut the supports at the points where they attach to the part. Use caution when cutting the supports, as the post-cured material may be brittle. Supports can also be removed using other specialized appliances, such as cutting disks or round cutting instruments like carbide burs. For a glossy surface finish, polish parts using a rag wheel and pumice at low speeds. After initial rough polishing, switch to a dry cloth polish. Finish with a high-grit acrylic buffing paste, such as Hi-Shine, at high speeds. 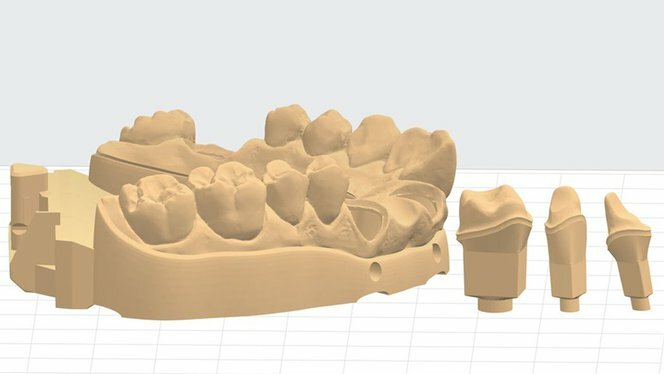 To check fit, print a solid model of the patient’s dentition, and place the splint on the model. Make adjustments to the 3D model or the post-processed parts if necessary. 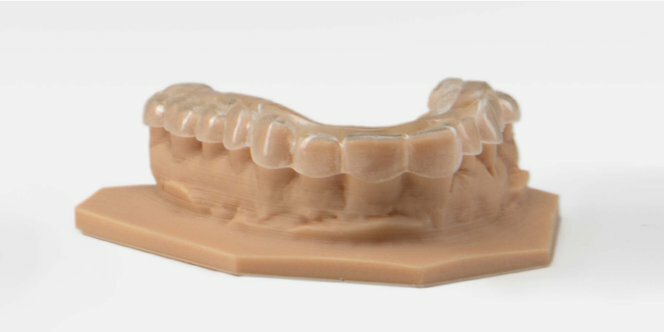 For printing orthodontic models we recommend Standard White or Grey Resin. 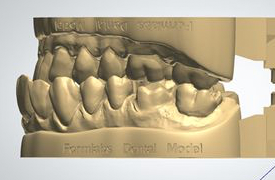 For higher accuracy, use Dental Model Resin. Use an ethanol solution to disinfect parts before use. 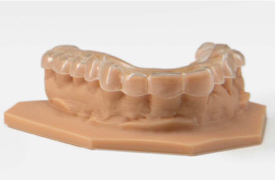 An in-depth accuracy study of 80 Dental LT Clear printed splints showed that intaglio surfaces of Form 2 printed splints were dimensionally accurate within ± 100 microns over 80 percent of the intaglio surfaces, and within ± 125 microns over 90 percent of the surfaces. This was found to provide a precise fit on both models and patients.